Andalusia has long been one of Spain’s poorest regions, suffering decades of oppression and neglect under Franco and remaining economically deprived since his death. In the 1980s, fed up with the government’s disregard for the country’s southern rural communities, one Andalusian village decided to fight back. Led by its charismatic mayor Sánchez Gordillo, Marinaleda embarked on ‘la lucha’, the struggle, and after many demonstrations and protests, including a ‘hunger strike against hunger’, the village succeeded in taking power into its own hands. Now, 30 years on, the town is still well and truly in the hands of the people. Gordillo remains the elected mayor, and his vision of a socialist community based on equality and co-operation has meant that the town is governed unlike any other. The village’s decisions do not rest solely on Gordillos’ shoulders; on the contrary, the community holds regular non-hierarchical general assemblies where key decisions are made by all residents. Many marinaleños work at El Humoso, Marinaleda’s own olive producing workers co-operative, which has helped to keep unemployment at 5% whilst surrounding villages can suffer up to 50% unemployment. In Gordillo’s own words, ‘our aim with the co-operative was not to create profit, but to create jobs.’ What’s more, whilst Marinaleda’s governance and work ethic is based on autonomy and self-sustainability, its residents are constantly demonstrating in solidarity for citizens across Andalucia and Spain. It was with this inspirational story in my head that I arrived in Marinaleda on a sleepy Saturday morning. The first thing that struck me was how clean and well-kept the village was: not a spot of litter; clean white walls; beautiful flowers and trees lining the main street ‘La Avenida de Libertad’. We noticed some interesting street signs – ‘Calle Ernesto Che Guevara’ and ‘Calle Salvador Allende’, and several beautiful political murals. Large white letters above a car park read ‘Otro Mundo es Posible’ – another world is possible – and the village’s flag, green for its rural utopian ideal, red for the workers’ struggle and white for peace, was hanging from several open windows. Of course, Marinaleda is not perfect. The town has its problems just like any other, not to mention widespread opposition and critics who claim it is under ‘messianic leadership’, where Gordillo ‘intimidates’ anyone who is not on his side. And you can’t help but doubt whether the village’s democratic, co-operative model could really be transferred to larger cities or countries. But I have to say, I find hope in Marinaleda’s inspirational story of how co-operative values can be put into practice for the benefit of an entire community, and especially that this community can stand the test of time and remain true to the values on which it was founded. To find out more about Marinaleda, read ‘The Village Against the Word’ by Dan Hancox. This week we look at one specific aspect of that – counter power. Building the new in the shell of the old. Below we have a list of organisations that are doing everything from simple basics, like where you put your money and what you buy, to creating whole new ways of eating, building and providing energy. We don’t want to just be pointing out the flaws in this disastrous system we live in, we want to help find the solutions and get involved. We hope that in the coming times when people say to you ‘nice idea but it wouldn’t work’ you can point to this list and say ‘but it already is…’. Please take a little time a click on the links – there is a lot of amazing information here. Buying locally? Or growing your own? Just some examples of radical art, music, and think tanks – there needs to be more! This is something that can liberate and us and can be seen all around in the modern world. There are so many different kinds of movements we haven’t listed them here, but check out any open source projects if you are into using your skills for good! There was a sense of unrepentant triumphalism from the proponents of neoliberalism as the Berlin Wall came down. Capitalism had won, Communism was dead – and it was the particularly rapacious Capitalism of Thatcher and Reagan ‘wot won it’. Francis Fukuyama – political historian and establishment toady – pronounced ‘The End of History’. The future had arrived, and it was one world, united, in the pursuit of profit. Unfortunately for Thatcher – and the entire establishment – trouble was brewing on the home front. Trouble that would eventually see the ugly demise of the most notorious Prime Minister of the post war era. 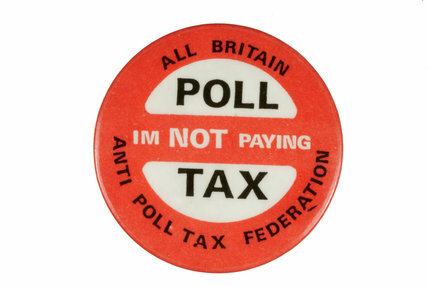 The Anti Poll Tax campaign started in 1987, from the very humble beginnings of a few people sitting in a room. By 1992 it had toppled the most notorious post war Prime Minister, organised the largest demonstration ever seen, and ultimately reversed the hated law. When the first meetings were held in Scotland in ‘87, in preparation for the roll out of the tax in ‘89 , people immediately moved the discussion onto non-payment. This is the sentiment expressed by Tommy Sheridan, which seemed to be widely held amongst Scots. The Poll Tax (or Community charge as Thatcher dubbed it) was an attempt by the Tory government to impose an equal rate of council tax for all people everywhere. ‘Why should a Duke pay more than a dustman,’ was the poorly thought out slogan for the policy. This immediately stirred the ire of the majority of the populace, as the logic was surely self evident. The left as it had been was not up to the task of stopping it though. The collapse of the Unions after the miner’s strike (and the Wapping press worker’s strike), three terms of Thatcher and failure of the Soviet system had put the left in a sort of malaise. When the Scotland campaign for non-payment took off the Labour Party and the TUC opposed it, and any action that broke the law. There were active groups in the UK, however, ready to start organising around the Poll Tax and boy, did they get a reception. Paying no heed to the Labour Party or TUC, Scots formed barricades and chased bailiffs off estates. The Militant (later the ‘Socialist Party’- a party of trotskyist Socialists who entered the Labour party, only to later be kicked out by Blair and Co) supported the formation of the Federation of Poll Tax Unions in 1988. This federation was democratically organised from the bottom up, with the members in total control. The decision to trial the hated tax in Scotland, was not only a cruel thing to do, but was also incredibly stupid. Haringey was one such place where people had been organising to make links with Scottish campaigners and prepare for the coming of the Poll Tax. A few local independent groups organised for it, including the Direct Action Movement (later Solidarity Federation, who had a key role supporting the federation across the UK), before the Labour Party, Communist Party and Trades Council organised a public debate in 1988. “In 1988, few people were aware of the impending Poll Tax”. (They) told us how bad it was going to be and then told us there was nothing we could do about it”. The idea of non-payment was far too popular though – and after the Scots had shown the way, the rest of the UK quickly followed suit. At first communities tried to fill up courts, making it impossible to try cases because of the sheer volume of people. This did lead to some sentences though, and soon the Poll Tax Federation realised that it was easier and more effective to simply not show up to court. It was impossible to get people to attend court, as communities organised watches for bailiffs and either chased them off, or hid from them. In the end, bailiffs gave up the ghost, there was too few of them, and too many people who didn’t want them there. The Labour party cravenly tried to enforce these cuts, with a few notable exceptions. In Liverpool – a Militant dominated council, the local MP and Militant activist Terry Fields refused to pay and spent sixty days in prison. Outside of these exceptions, it was ordinary working people mostly, who organised themselves into the Poll Tax Federation. By the beginning of 1990 the Federation decided to call a demonstration. It was clear that the campaign was winning, but the chance to come together and feel the power of the united movement was seen as important. Class War – the Anarchist insurrectionists famous for such stunts as ‘Bash the Rich’ where they famously they beat up the rich denizens of the Henley regatta and other such stunts – managed to take control of the front of the march. 250,000 people had turned out. There had never been a demonstration so large in England. Local demonstrations went on in almost every locality in the UK. As the march paraded around London, council buildings, town halls and other symbols of power were being occupied and attacked all round the country. Class War managed to lead the march in a different direction than expected, and as it split in two, one part of the demonstration began to rally in Trafalgar Square. With no provocation, and for no seeming reason (other than maybe feeling overwhelmed by the size of the demonstration) the police charged the families and working people in Trafalgar Square. The footage of them driving cars and horses into the, originally peaceful, demonstration, quashed any claims of Anarchists and trouble makers being to blame for what happened next. The crowd reacted to the horses charging by defending themselves with whatever was available. A nearby building site was ransacked, and as the Police broke in panic, the City of London, and central London in general, became a target for the demonstrators ire. In the aftermath, Class War was blamed for inciting a riot. Whilst it did not claim responsibility, it was clearly the police’s fault, a member of Class War called everyone on the march ‘working class heroes’, including the rioters. This made them scapegoats, as the rest of the movement – including the Militant, the Labour Party, and the TUC – turned on the rioters across the country for their lawlessness. As it turned out, all the arrests for violence got overturned thanks to the new technology of hand held video cameras catching the true culprits – the police. Undoubtedly though, there was huge amounts of property damage, and not just in London, but across the country. In some places the damage continued for days. The campaign became even stronger from this point, and more popular. The attempts to divide people had failed, and the Militant’s Tommy Sheridan even retracted his condemnation of the demonstrators. Activity was now focused on prisoner and court support, as the Conservative Party realised it was rapidly losing complete control of the country. Very few people (less than 100) nationwide went to jail for non payment, or for the Trafalgar Square riots. What sentences there were, were mostly short – though a small number of people went to prison for over a year. In October another 50,000 person demonstration escalated into a riot, the lower turn out mostly explainable by the fact that it was clear that the campaign was being won. The Tory party was on the brink of caving, and the local Poll Tax Federations were stronger than ever. In November, several Tories challenged Thatcher for leadership of the party. She didn’t even make it through the first round of voting. John Major was elected. He continued to try and enforce the policy until the Spring of 1991 when he finally capitulated, reversing the policy, though attempts were made to collect the unpaid taxes to date. They are still waiting for hundreds of millions back – including at least £15 million from Liverpool. The incredible thing about the whole campaign was it showed that when people just decided not to pay their tax, en masse, there was simply no way for the state to collect it. The government had to write off millions in lost revenues. Taxes are fundamental to the functioning of the modern state (by which I mean the repressive elements of the state – the police, the army, the government). If people suggested a campaign of non-payment of tax now, you may be looked at as in insane. But it was only 1990 when the British people last decided to withhold their money, and look what happened. Was this the End Of History? No, it was just the Beginning. We know that if we are to avoid catastrophic climate change we need to leave 80% of Fossil Fuels in the ground. We also know that if we meet our climate change targets we will be 62% less dependent on foreign oil and gas. Finally we know that the ‘Big 6’ energy companies have a basic monopoly over our gas and electricity bills and that they are rising them year on year despite falling energy costs for them. Yet our government is determined to continue the dash for gas – building more gas power stations and bribing/forcing communities into having fracking on their doorstep. Why? So these six companies can keep making enormous profits and destroying the planet? We need to reclaim our energy. We can create jobs, save money on our fuel bills and make sure that our communities have a safe, clean source of energy for a long, long time. Our governments and large corporations should be supporting and investing in energy efficiency, house insulation and renewable energy. But as they have vested interests to do the opposite, to maintain profit and power for themselves, we must look to ourselves. We can follow energy projects like the carbon coop and create renewable power for our community that keeps us off the grid and saves us money. We can invest in retrofitting our houses, and creating energy efficiency. All of this creates jobs, and brings communities together. We can do this now. We don’t need to be told what our energy future is, we can create it ourselves. We can reclaim our energy. Following the guest post from Maddy Evans about the upcoming event The Spark!, we take a look at another video from the Economic Justice Project which features interviews with people on the front lines of major movements, protests and strikes in the last 50 years. The videos give fascinating insight into the tactics and mindsets of people who fought back, as well as some handy advice for future generations. This video talks about the Poll Tax rebellion in the early nineties. It was Tony Benn’s 5th and most important question for the powerful, and likely a huge factor in voting apathy – How do we get rid of government? With a record of 70 broken pledges and counting, including increasing transparency, tackling youth unemployment, greener energy (Vote Blue, Go Less Green), the coalition have shown that governments are currently free to run roughshod over promises and proceed with any plan they wish. But, if governments are not accountable to the public, we are not living in a democracy. Some may bemoan the non-voters in Thursday’s 33.8% turnout, but when you note that the government we have (you know, the one that no one voted for) have reneged on all but a sorry handful of their election promises and yet are allowed to continue with impunity, I can’t blame them. There should be ways to rid ourselves of a government. A system of accountability that keeps the political party in power in fear of exploiting votes that got them in. If politicians thought they would be pulled from power when reversing on election promises, perhaps we’d see less flamboyant, but more honest pledges. Perhaps the PR machine would be less well adjusted to maintain the pantomime. I’m sure at least, we’d see more votes. Not that politicians are interested in all that. There seems to be an enjoyment taken from the disaffected, under-served majority. Have you heard the new plans the government are undertaking to engage some of that whopping 66%? No, neither have I. Even for those that do vote, there’s a purgatory of mind-boggling strategic voting that no one knows the rules to. Pushing us to opt for a party you think might win rather than the one you want, frantically making compromises on our basic values before we’ve reached the ballot box. Democracy, circa 2014. Creating conditions as opposed to unabashed free reign would be a restoration in the power of the collective public, undermining Westminster egos, ulterior motives and hidden agendas. If we want a government that works for us, this is a huge part of getting it. It would also take some power from corporations, who at present gift change from bottomless bank balances, lobby and stuff influence-buying backhanders into the pockets of our decision makers. You need only type the words ‘white collar crime’ into Google to see the rollicking, sordid bed shared by politicians and millionaires. Indeed, political impunity seems to extend to the fact that cabinets and MPs don’t even have to come close to representing us. I mean, what can we really expect when our government is vastly staffed with the same 1% of people that have continued siphoning wealth and resources whilst austerity rings out across the rest of us. Perhaps if there was a conditionality to being in power, some of these people wouldn’t be our candidates. Citizens UK: Reweaving the Fabric of Society. Citizens UK are an important and growing community organisation that aims to “reweave the fabric of society” by empowering, training and providing advice to local groups and campaigns on taking their demands to politicians and achieving change. Citizens UK provide an alternative way of achieving the needs of society and takes back the debate in favour of what local groups want and need. Watch their video “The Road To 2015” below. Visit their website here.